In Sedona, two aging cowpokes bust broncos, charm local ladies and bet on outcomes at the rodeo. An aging cowboy finds to his embarrassment that the successful business he has inherited from his brother is actually a house of prostitution. A woman who has been married and divorced five times comes back to her small hometown, where she proceeds to complicate, and potentially destroy, the marriage of her childhood boyfriend. Sam Rhine, Hotel Owner: How is he? Toby, Barfly: The Doc wants the shutter that used to carry drunks out. Well, this movie certainly beats the pants off watching THE CINCINNATI KID (the only other poker movie I can think of off the top of my head). 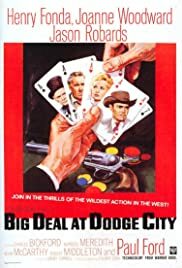 It is a very unusual film set in the old West about a family passing through town and the head of the family who gets suckered into playing a high-stakes poker game and seems on the verge of losing everything. And, at the crucial moment when he is on the edge of either winning or going bust, he becomes too ill to continue and his wife, by default, is brought in to take his place. The movie, despite the BRIEF overview I gave, is far deeper and is a super-intelligently written film. There are many wonderful twists and turns, but if I let it out of the bag, it would ruin it for you. Just give the movie a chance--it's a buried treasure. 32 of 36 people found this review helpful. Was this review helpful to you?